This post is about the impact of my being legally blind, the impact this condition has on my photo-artistry, and to offer a follow-up to the two radio interviews that I've given on this subject. These interviews are posted on my web-site. One interview is with Karen Ingenthron Lewis. She conducted this interview for W.B.A.I. Radio (a prominent FM station in New York City) for the program, The Al Lewis Show. Al Lewis was known for his role as Grandpa in the television series, The Munsters. The other interview is with John Montone. He conducted this interview for 1010 W.I.N.S. (a prominent AM station in New York City) for his news feature, John Montone's New York, where he posed the question (regarding legal blindness and photo-artistry), "It takes a sharp eye...or does it?" In addition to my being born with NF (discussed in the second post), I came into the world with a severe form of myopia. The latter was complicated by my having a long eye-ball and a stretched retina, causing me to have extremely low vision. The prevailing attitudes about women who wore glasses during the year that I was born most likely shaped my mother's attitude about my wearing glasses. Her opinion also formed my view of having to wear them during childhood, which in retrospect, contributed to my artistic temperament. My mother was a movie buff, and often told me that she had spent most of her high-school days at the cinema. I can still remember being told that the year before I was born, one of her favorite movies was How to Marry a Millionaire. This movie was a wide success, partly due to the character of the protagonist, Pola (played by Marilyn Monroe), and her attitude towards wearing glasses - preferring to walk into walls rather than risk a man seeing her wear them - and who was convinced that Dorothy Parker was right by saying, "men seldom make passes at girls who wear glasses." The times, of course, have changed, and so have attitudes (to some extent) about wearing glasses. Some people even wear glasses - with no correction in them - to achieve a certain look. Obviously, had I been born at a different time, during a different mind-set, or if my folk's consciousness was raised when it came to low vision issues, my perception might have been totally different. The background I am giving here is to set the tone for what it was like to grow up at the time I did, and how that shaped my artistic endeavors. A few months before my fifth birthday, and the onset of kindergarten, my mother suggested that I start a hope chest, and began filling it with dishes that I might need if I was 'fortunate enough to have someone to marry.' My mother (who did not wear glasses) was already worried that I would not have a boyfriend since I wore thick glasses. Perhaps this is because when she was growing up, she was surrounded by many aunts who were single (although they did not wear glasses), and who were labeled 'old maids' - even though they longed to be married. When I first went to kindergarden, I was not thinking of dishes that I might need to start a household. My perspective of having low vision was this: "I have worn very thick glasses with pointed pink frames since I was three. Once when I stayed overnight at a cousin's house, I wore them to bed - thinking if I had to get up at night to pee, I would surely need to find my way to the bathroom. When my cousin discovered this, she told everyone that I even needed glasses to see my dreams. That’s when the neighborhood kids started calling me 'Four Eyes' and 'Little Miss Coke-Bottles,' and saying I was 'blind as a bat.' I cannot tell Daddy this, because he wears thick glasses too, and I don’t want to hurt his feelings. Mom, who doesn't wear glasses, says I can take them off if I want people to like me. But I can’t do this, since without them I see very little - and what I do see is fuzzy. If I say I wish I could be like my sister and not wear glasses, she calls me a green-eyed monster. I do have green eyes so I suppose she is right." 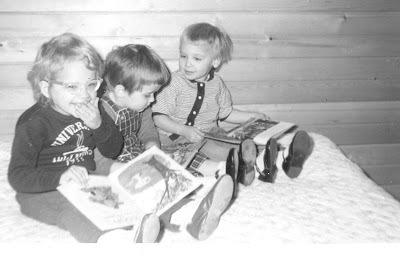 It seems odd now, as I write this blog, to think that wearing glasses pained me so much, and looking at this snap-shot below, taken before those kindergarten days, you'd never suspect that wearing glasses made me feel unhappy. (I'm the one on the left.) For me, one of the perks of those pre-school days, is that I was not with so many other children, and so I didn't perceive there was anything 'wrong' with me (other than my mother's wish that I did not wear glasses and occasional teasing from my sister and cousin), until I started elementary school, where I became the target of cruel remarks. My mother is the one who took this photo (most likely coaxing a smile) of me when I was with one of my cousins and my sister. 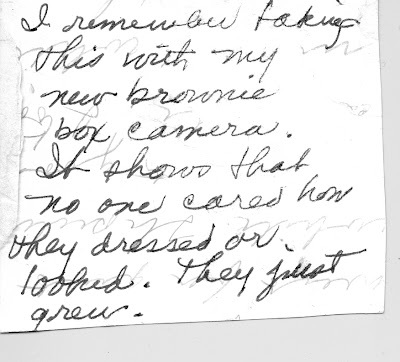 My mother spent a lot of time looking at life through the view-finder of her Kodak-Instamatic plastic camera, preserving memories of how she wanted my sister and me to remember our childhood. Perhaps behind the lens, she was protecting herself from the sadness she must've felt, seeing others make fun of me. At one point, she even blamed herself for my low vision, saying that if she had not taken so many photos of me as a baby, and allowing the flash to go off in my eyes, my eye-sight might not have been so poor. I don't know how he felt about his low vision, because he divorced my mother when I was a child, and I did not see him often. 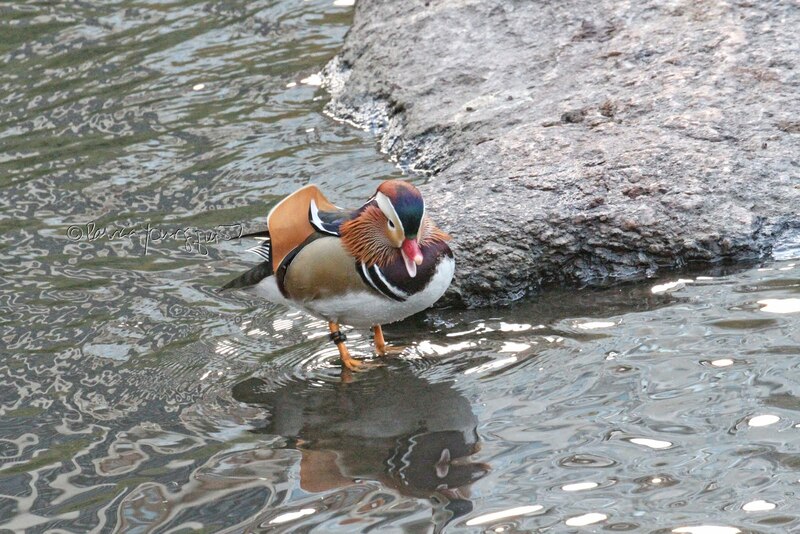 However, that might not have made much difference, because he was not one to share his feelings on many subjects. I do know, that unlike my mother, my father did not grow up around doting family members. What I know about my father are things I learned from his older sister, Evelyn Youngquist Swain, a celebrated ceramic artist whom I did not become acquainted with until I was in my thirties. 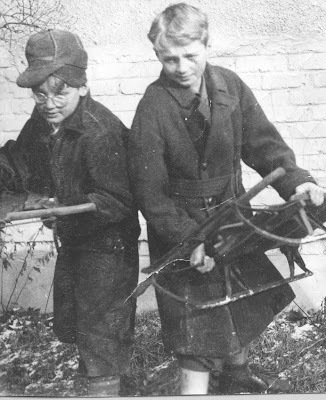 When she sent me this photograph of my father's boyhood, she enclosed a note on the back, giving me her perception of the neglect he experienced in boyhood. I am sharing these details with you in this blog because it should be kept in mind that the stories of my father are through Evelyn's perspective. Evidently, she was in high-school when he was born, and it is her perception that my father spent the first few years of his life not being able to see very much, and that his need for correction was ignored because their mother, Clara Loth Youngquist, had moved out of state - without her family - due to severe asthma problems. According to Evelyn, who claimed she received full parental attention, my father's need to wear corrective devices was ignored for a number of years. She would recount this story whenever I expressed memories about my childhood and the reactions I had experienced from others over my need to wear such thick glasses, and to the loneliness I had felt when my father moved out of the house. "What do you expect," she'd say, "He can't give you what he didn't get from his parents?" Although my father had poor vision in both eyes, one eye performed much worse than the other. This can cause the eye with lesser vision to 'turn in' giving the appearance of being cross-eyed. I too have this manifestation, and once in the 1980's, I was asked by a commercial casting agent at Abrams Artists, in New York City, if I minded the fact that my eye turned inward. The agent did not wait for my answer, but proceeded to tell me, that during her high-school years, she made fun of someone whose eye did this. Fanny 'Wink' Sonnenschein, my father's grandmother, and my great grandmother, had this affliction too. One of her eyes performed so much less than the other, that she was nicknamed Wink, by her mother, Rosa Fassel Sonnenschein - the "flamboyant editor and publisher of The American Jewess, the first (1895) independent American Jewish magazine, published by a woman" and dedicated to issues concerning women. Rosa is shown in the image below "on the cover" of her publication, a ploy Oprah Winfrey has done with putting herself on the cover of her "O" magazine. However, in Rosa Sonnenschein's case, I don't know if she put her photo on every issue of her publication as Oprah continues to do. 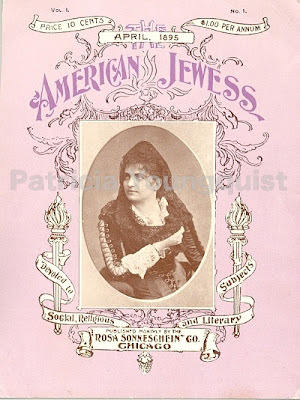 "Rosa Sonneschein (1847-1932) was the flamboyant editor and publisher of The American Jewess, the first independent American Jewish magazine published by a woman for women. After every meal Sonnenschein relaxed with her favorite cigar, 'Between the Acts.' She had taken up the habit when her physician suggested that an after dinner smoke might prevent the indigestion she suffered from the constant dinner disputes with her husband. When her four children were grown, she terminated her disastrous marriage and turned to publishing as a means of livelihood. Her magazine boasted 29,000 subscribers during its brief run (1895-1899). 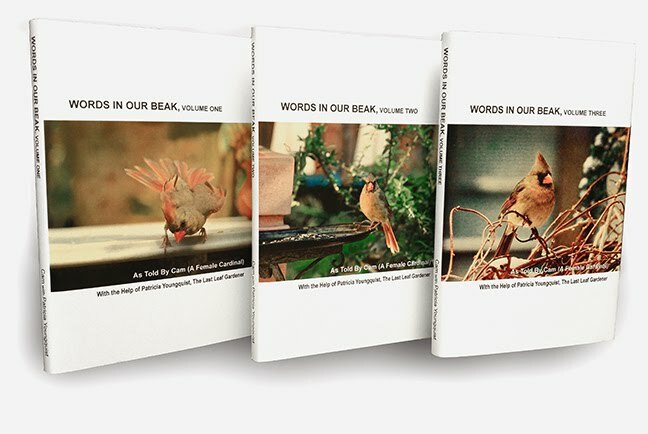 She brought to the magazine her great story-telling ability along with a global view on people and events. Most articles were written by women and covered social and religious issues as well as literature. In one editorial she wrote 'The New Woman! The new Woman! That is the cry on every side. But where, oh where, lingers the New Man? Is he looming on the horizon, or will the feminine phoenix still have to content herself with the Old Specimen?' After attending the first Zionist Congress in Basle (1897), she wrote about women's disenfranchisement with the emerging socio-political movement. She saw no conflict between her feminism and her liberal Judaism, and was impatient with all who failed to recognize women's religious equality and their potential power as change agents in the community." I was sent this card by my great uncle David Loth who was the son of Fanny 'Wink' Sonnenschein. He had heard about me through my ceramic-artist-aunt. By the time I met David Loth, I was in my thirties and he was eighty-six years old. I was able to meet him on only two occasions prior to his death, and he had much to say about this background, including the fact that Rosa's husband, Solomon Sonnenschein, was 'a child of the first night,' and that because of this, it wasn't thought he would go to rabbinical school, much less study at Jenna, or that he would be a successful Rabbi in Warasdin, Prague prior to coming to New York where he was a successful Rabbi, before founding a synagogue in Missouri. My great uncle David Loth, was afflicted with very low vision, but was not deterred from a successful journalism career as he used devices to help him read. Thankfully, as you may have heard in my interviews, I've also been able to adapt equipment to meet my needs, when it comes to my photo artistry and doing computer work. The details in this post are intended to set up a context for viewing my art work and to encourage others with a visual challenge to pursue endeavors despite the visual restrictions.